Back in May, this is what our back hill looked like. 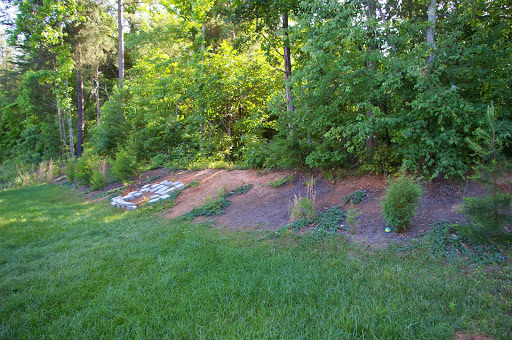 Don’t let the brown pine straw fool you — that’s all hard red clay under there. 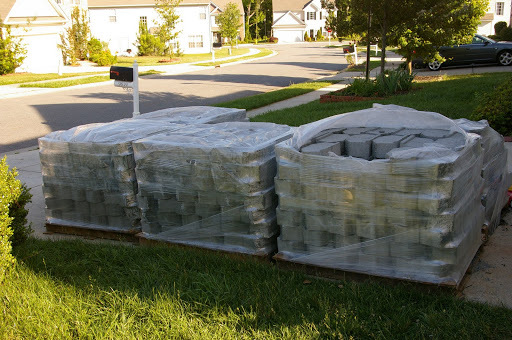 After much deliberation, many trips to home improvement warehouses, and much haggling, these six pallets of bricks were dropped off in our driveway. 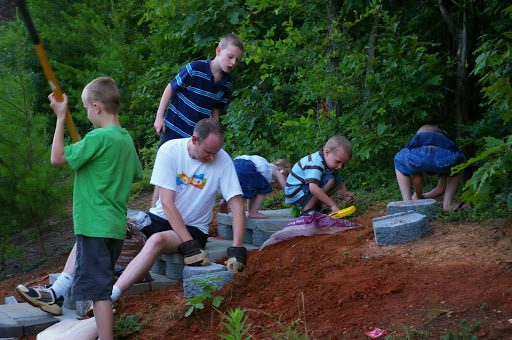 We paid our kids $.20 a brick to get them to the backyard. They lost interest pretty quickly, so a couple mornings a week David and I went outside around 5:30 a.m. and trucked them back. Then the work began. The most time-consuming work by far was the base of each level. David spent many a night cutting into the clay, placing a brick, leveling, setting down stone dust, and leveling some more. Then, along with the help of his faithful work crew, he built the stairs. After the stairs were built, we were able to build up the walls to their full height. 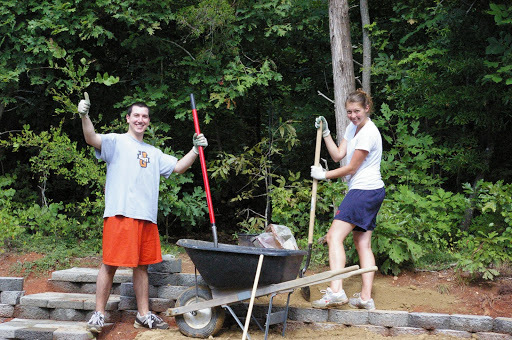 We started this process one night, not realizing that with a retaining wall, you must fill in behind with dirt as you build. We built about a third of one level before it started raining one night. When we got up the next morning, all the bricks were laying down flat on the hill behind them. Whoops! But David kept on going! When the job got really time consuming, we enlisted the help of faithful and buff friends, bribing them with breakfast on a hot Saturday in July. Thanks Andy and Erin! David and his friend Jobey finished it out one Monday night, completing the work after dark. They came inside when they were done and the sweat was, quite literally, pouring off of them. I had to mop after they left. GROSS, but I wasn’t complaining. Here’s the almost-finished product. Since I took this picture, David has put in end caps at the ends of each bed, so they have a more finished look adjoining the stairs and on the ends. I can’t wait to haul in some compost and start planting! Most of that will probably wait until fall, though. This entry was posted in homekeeping, summer. Bookmark the permalink. who is that really hott guy you have there helping you? is he available??? 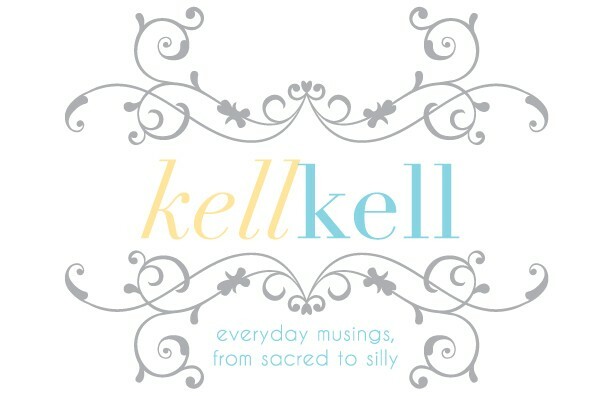 =)it looks great kelly! I cant wait to see (and maybe eat) all the fun things you plant in there! 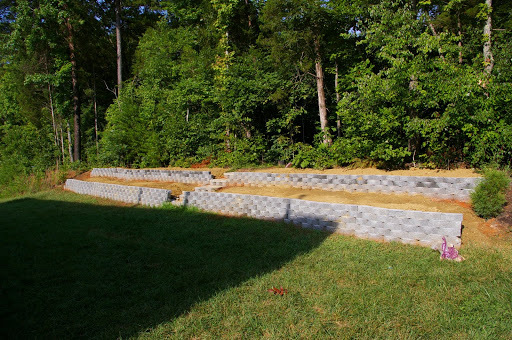 Now I feel like a sissy for hiring out our retaining wall… way to go, David & co! !